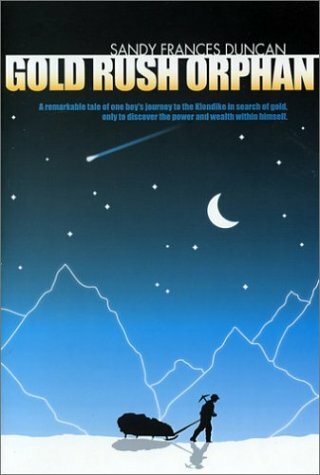 In Gold Rush Orphan, Sandy Frances Duncan has woven a gripping tale of hardship and adventure based on her grandfather's gold rush journal entries of his 1898 trip to the Klondike. The arduous trek to the goldfields come alive in the fictionalized story of Jeremy Britain, an orphaned youth who joins James Fraser and his companions to search for the gold that would make their fortunes. Venturing into uncharted lands, Jeremy begins furiously panning the streams as he follows a mysterious account that promises the motherlode. For ages 9-12. Sandy Frances Duncan has woven a fascinating tale of hardship and adventure based on her grandfather's gold rush journal entries of his 1898 trip to the Klondike. The arduous trek to the goldfields comes alive in the fictionalised story of Jeremy Britain, a young teen who joins James Fraser and his companions to search for the gold that would make their fortunes. Duncan begins the story in the gold rush port of Skagway where Jeremy has a run-in with the infamous Soapy Smith and his gang. The cruelties and lawlessness of life on the streets of Skagway merge with the implacable storms of winter as Jeremy struggles with the rest of his crew to climb the White Pass, not once but many times, in order to carry all the supplies needed to survive in the wilderness. It is a never-to-be-forgotten trip as Jeremy and the men struggle to care for the horses and dogs carrying the crew's supplies through deep snow and freezing temperatures. Once spring break arrives, there is the new challenge of navigating the swollen rivers on home-made rafts and boats. When Jeremy's group unexpectedly veers away from the usual route to Dawson and the Klondike to venture into uncharted lands, Jeremy begins furiously panning the streams they cross as they follow a mysterious account that promises the mother lode.